Are some of many things Camas residents love! The purpose of the Camas comprehensive plan update is to ensure that in 2035, the City remains vibrant and diverse and meets the needs of its residents. In the year 2035, residents of Camas continue to appreciate their safe, diverse and welcoming community. Camas maintains its small town character while accommodating future residents. The City is well known for its excellent schools, thriving businesses, and ready access to metropolitan amenities and natural features. A vibrant downtown brings neighbors together and is enjoyed by all. Camas has a long and rich history. More than 10,000 years ago, Native Americans occupied the Columbia River Valley. The Lewis and Clark Corps of Discovery camped by the river in 1806. In the late 1800s, the La Camas Colony Company of Portland purchased 2,600 acres and began planning the construction of a paper mill to supply newsprint for The Oregonian. With the construction of the mill came the platting of the town and the beginning of today’s city, a vibrant and diverse community that occupies approximately 16 square miles and is home to nearly 23,000 people. 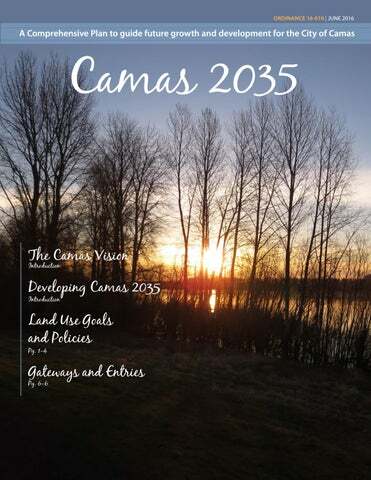 Camas 2035 is the update of the City of Camas comprehensive plan. The purpose of the Camas update is to ensure that, in 2035, the City, which was incorporated in 1906, remains a vibrant and diverse city that meets the needs of its residents. The history of Camas comprehensive planning dates back to 1963 when the first plan was prepared. In 1990, the state adopted the Growth Management Act (GMA) with the goal of managing the growth of cities that had heretofore grown in an uncoordinated fashion. GMA requires municipalities to consider the provision of the utilities and services necessary to serve new residential subdivisions, commercial centers, and industrial sites before approving their development. The last major update to the City’s comprehensive plan was in 2004 when Camas was a community of approximately 15,360. By 2015, the City’s population had grown to 22,843 and annexation had added 2,400 acres, mostly north of Lacamas Lake. In order to create a vision for the future, it was important to understand the today. Camas 2035 has been guided by the community vision established over a 6-month process that involved hundreds of community members. In this process, we examined where we’ve been, how we’ve grown, what we do, and who we are today– to better understand how we will grow. The vision is written in the present tense, as if describing the city as it exists in 2035. Some aspects of the vision can be found in Camas today, while others represent aspirations. It was adopted by City Council Resolution #15-002 on February 17, 2015, the vision provides a framework for the goals and policies of every element of Camas 2035. Introduction to Vision In the year 2035, residents of Camas continue to appreciate their safe, diverse and welcoming community. Those that were raised in Camas will return for family wage jobs, and to ultimately retire here. Camas maintains its small town character while accommodating future residents. Camas is well known for its excellent schools, thriving businesses and ready access to metropolitan amenities and natural features. A vibrant downtown and community events bring neighbors together and are enjoyed by all. Vital, Stable and Livable Neighborhoods Camas is a well-planned and connected city where residents enjoy pedestrian and bicycle paths between neighborhoods and to downtown. Historic structures are maintained and rehabilitated to accommodate new homes and businesses. There is a wide variety and range of housing for all ages and income levels. Quality public facilities, services and utilities contribute to a high quality of life. Diversified Economy The economy has grown to attract a variety of businesses that offer stable employment opportunities and family wage jobs in the medical and high-tech fields. Camas is a gateway to nature and recreational opportunities, leading to a robust tourism industry. Professional office, medical and industrial uses will typify western Camas, with retail businesses supporting the large campus firms. The north shore area will fulfill the employment and retail needs of the growing population on the northeast side, and reduce trips outside of the city. Downtown Camas retains its historic atmosphere as a walkable, attractive place to shop, dine and gather. Housing within the city’s core contributes to a town center that supports local businesses. How we’ve grown... Camas has added nearly 7,500 residents since 2004! But we’ve added more than 1,300 acres of land to our city over the past 10 years. Residential density is among the least dense urban areas in Clark County. Public Services Camas continues to have an excellent school system, an asset that draws families to the community. Students and their families enjoy the city’s parks, trails, community centers and other recreational opportunities. The library continues its vital role as a place of learning. Residents value well-funded police, fire and emergency response services. Proficient government agencies maintain existing city assets and coordinate future development. We have pride in and honor our natural areas. Camas appreciates and remains good stewards of its natural environment. A vegetated corridor provides habitat and safe passage for wildlife from Green Mountain to the Columbia River. Lacamas Lake is treasured as a unique and pristine resource. City policies preserve trees and natural areas. Each element sets goals that will implement the vision and expresses policies that will guide land use and infrastructure decisions for the 20-year planning horizon. The elements are supported by the comprehensive plan map, which identifies land use designations throughout the City and within its urban growth area. Why Plan? Planning is choosing what to do and how and when to do it. Planning is part of our everyday lives. We plan our vacations, our family budgets, and even our trips to the grocery store. The detailed planning of our daily lives derives from a set of goals that we want to accomplish – in a day, in the next six months, or the next two years. In the same way and for the same purpose, the City’s plan is the basis of coordinated action – it enables public and private interests to undertake projects with a clear understanding of community goals and policies. Camas 2035 helps the City identify deficiencies and take steps to remedy them. Planning can find desirable and reasonable solutions before the problem is beyond the community’s economic capabilities. The plan is crucial to avoiding uncoordinated activities as the City adapts to changing conditions and experiences the population growth that is anticipated. The plan is not intended as a rigid system of goals and development policies; rather, it is: •	Long range – looks ahead as far as is practical to anticipate growth and resulting community needs. •	Comprehensive – relates and integrates all types of uses and necessary public facilities. •	General – establishes general locations and areas for the elements and indicates their relationships to each other and the population they serve. •	Responsive – through regular updates, adjusts to changing conditions, unforeseen circumstances, and local and regional trends. How is a Comprehensive Plan Related to Other Plans? Camas 2035 is part of a family of state, regional, and local plans. Some, like statewide GMA and Clark County’s Community Framework Plan, set the overall planning framework and guide the content of the Camas comprehensive plan. Others, like plans that are specific to particular subareas, supply more detailed information about individual topics or smaller parts of the City. the retention and expansion of existing businesses and recruitment of new businesses, recognize regional differences impacting economic development opportunities, and encourage growth in areas experiencing insufficient economic growth, all within the capacities of the state’s natural resources, public services, and public facilities. 6. Property rights. Private property shall not be taken for public use without just compensation having been made. The property rights of landowners shall be protected from arbitrary and discriminatory actions. 7. Permits. Applications for both state and local government permits should be processed in a timely and fair manner to ensure predictability. 8. Natural resource industries. Maintain and enhance natural resource-based industries, including productive timber, agricultural, and fisheries industries. Encourage the conservation of productive forest lands and productive agricultural lands, and discourage incompatible uses. 9. Open space and recreation. Retain open space, enhance recreational opportunities, conserve fish and wildlife habitat, increase access to natural resource lands and water, and develop parks and recreation facilities. 10. Environment. Protect the environment and enhance the state’s high quality of life, including air and water quality, and the availability of water. 11. Citizen participation and coordination. Encourage the involvement of citizens in the planning process and ensure coordination between communities and jurisdictions to reconcile conflicts. 12. Public facilities and services. Ensure that those public facilities and services necessary to support development shall be adequate to serve the development at the time the development is available for occupancy and use without decreasing current service levels below locally established minimum standards. 13. Historic preservation. Identify and encourage the preservation of lands, sites, and structures, that have historical or archaeological significance. 14. Provide consistency. Between shoreline management and growth management by considering the goals and policies of a shoreline master program for a county or city, approved under Chapter 90.58 RCW, as an element of the county or city’s comprehensive plan. Urban Growth Areas An urban growth area is a defined area of land adjacent to city limits within which urban growth is encouraged and beyond which growth can occur only if it is not urban in nature. Each county that adopts a comprehensive plan under the GMA must designate urban growth areas. The City of Camas has 1,962 acres of land within the urban growth areas that adjoin the City limits. This land, combined with the vacant land available within the City limits, must accommodate the City’s population and employment projections as established by the state’s Office of Financial Management. The population and employment projections for the City for the year 2035 are 34,098 people and 11,182 additional jobs. The City currently has adequate land to accommodate these projections. Expansion of the urban growth areas is not necessary with Camas 2035 (see the Land Use Element for additional details). County Planning Goals and Policies The Community Framework Plan, adopted by Clark County and its cities and last updated in 2007, guides local jurisdictions as they work to decide questions of regional land use and services. Clark County is in the final stages of fully updating this plan for 2015 through 2035. As County and city plans were developed, representatives of the City of Camas met on a regular basis over the span of two years with officials of the County and its cities to coordinate efforts. This level of communication helps ensure that the plans and capital projects of these jurisdictions are consistent when adopted. Camas 2035 is consistent with the concepts put forward in the County’s Community Framework Plan, and the initial drafts of its pending comprehensive plan, and the countywide planning policies as required by RCW 36.70A.210(1), WAC 365-196-305, and WAC 365-196-510. Developing Camas 2035 Camas 2035 began with a citywide process to envision our desired future for the 20-year planning horizon. Public outreach involved over 600 community members, three questionnaires, several interviews with stakeholder groups, the development of a Steering Committee, and two public vision summits. The result was the vision for Camas 2035 that is stated at the beginning of this document. This vision guided the update of every element that is part of Camas 2035. Appendix A discusses the public outreach involved in the visioning process. The second phase of public outreach consisted of a Technical Advisory Committee (TAC), the continuation of the Steering Committee, a community survey, and a public forum. This second phase focused on implementation – making sure the goals and policies established in Camas 2035 were consistent with the community vision. The purposes and functions of the Steering Committee and the TAC are described further below. In addition to the outreach efforts described above, the City maintained a website and Facebook page throughout the visioning process and the development of Camas 2035. Steering Committee The Steering Committee was formed at the outset of the visioning process and consisted of identified leaders of the community. This committee spearheaded the outreach efforts, and was integral to shaping the vision of Camas 2035. Throughout the development of the plan, the Steering Committee continued to ensure that the vision was upheld and consistency was maintained throughout each element of the plan. The Steering Committee met three times during the visioning process and three times during the development of Camas 2035. Technical Advisory Committee The TAC was formed to help ensure that Camas 2035 would adhere to the community vision and meet the public service and infrastructure needs of a growing city. Members of the TAC were selected for their technical expertise and knowledge of key plan elements such as transportation, parks and trails, neighborhood livability, and employment. The TAC met five times from March to October 2015 and provided invaluable input on each element of Camas 2035. The first two TAC meetings focused on establishing community gateways and corridors. During the visioning process, many residents voiced their desire that the entrances to our City be welcoming and identifiable. The TAC and staff worked together to identify gateways and gateway elements such as signage, lighting, sidewalks, and crosswalks that will distinguish Camas from neighboring cities. These gateways are included as overlays on the City zoning map and the Economic Development Element identifies specific goals and policies for them. Community Surveys During the two years it took to complete the visioning and comprehensive plan update process, community members were asked to complete three surveys. The first and second occurred during the visioning process in 2014 and early 2015. The purpose of the first survey was to identify Camas’ strengths and understand what residents’ value about Camas today. More than 400 community members completed the first survey. The second survey was intended to validate the draft vision statement and was completed by 177 community members. The third survey, conducted in December 2015 and January 2016, asked respondents to indicate their preferences for development styles and features and to validate draft comprehensive plan policies, and was completed by 182 community members. Summaries of each community survey are included in Appendix A. Vision Summits and Public Forum During the comprehensive plan update, the City hosted two vision summits and one public forum. The first vision summit was held on November 5, 2014 to discuss the future vision for the City. Approximately 50 community members gathered at Fire Station 42 and were asked to complete the sentence, “In 2035, Camas is/has/enjoys…” This input together with online surveys helped frame the Vision Statement. The second vision summit was held on January 8, 2015 to solicit feedback on implementing the vision, and was attended by approximately 120 community members. On January 14, 2016, a public forum was held in order to review the first draft of the updated comprehensive plan, including proposed zoning and comprehensive plan maps. Approximately 43 community members attended and provided feedback. The City of Camas values residents’ opinions and is committed to being responsive. The final comprehensive plan incorporates the contributions and comments from everyone who has been involved to date. We attended in 2014 and 2015 to gather feedback. The Land Use Element is designed to support development that adheres to the Cityâ&#x20AC;&#x2122;s vision to ensure Camasâ&#x20AC;&#x2122; future is as bright as its past. Vision In 2035, Camas is a well-planned and connected city where residents enjoy pedestrian and bicycle paths between neighborhoods and to downtown. The economy has grown to attract a variety of businesses that offer stable employment opportunities and familywage jobs in the medical and high-tech fields. Professional office, medical, and industrial uses typify western Camas, with retail businesses supporting the large campus firms. The North Shore area fulfills the employment and retail needs of a growing population on the east side, and reduces trips outside of the city. Downtown Camas retains its historic atmosphere as a walkable, attractive place to shop, dine, and gather. Housing within the city’s core contributes to a town center that supports local businesses. Camas appreciates and remains good stewards of the environment by preserving trees and natural areas. Land Use Overview The City of Camas is home to great schools, family-wage jobs, highquality neighborhoods, and an abundance of open space and recreational amenities. Camas has grown into a dynamic, vibrant city with diversified employment opportunities and services that cater to its residents’ various needs. In 2015, Camas maintains its small town charm and character, and downtown remains the heart of the City with a mix of restaurants, shops, professional offices, and residential development. The Grass Valley area is home to several national and international technology and manufacturing firms. A significant amount of residential development is underway in the Green Mountain area, and planned transportation improvements in the North Shore area will improve connectivity and provide better transportation options throughout the City. The Land Use Element is designed to support development that adheres to the City’s vision to ensure Camas’ future is as bright as its past. The GMA identifies the Land Use Element as the foundation of the Comprehensive Plan. GMA outlines the framework by which the plan will be implemented and establishes land use designations to accommodate the City’s population and employment projections. The development of land in accordance with the goals and policies included in the Land Use Element will ensure the achievement of an appropriate balance of public facilities, housing, employment, services, and recreational uses throughout the City. Source: Clark County Buildable Lands Report, unless otherwise noted. See Appendix B. 1 Capacity calculated as net developable acreage using the County Vacant Buildable Lands Model and further refined based on GIS analysis conducted by the City. 2 Based on 2013 American Community Survey data, consistent with Clark County Buildable Lands Report. Overlays In addition to the land use designations listed in Table 1-2, land use overlays further define appropriate uses and development standards for particular areas within the City. Overlays included in this update are identified as follows: • Airport Overlay • Gateways and Corridors • Multi-Family Cottage The 2004 Comprehensive Plan included additional overlays (Planned Industrial Development, North Dwyer Creek Employment Mixed-Use, and North Dwyer Creek Residential Mixed-Use). These areas have developed since 2004, the overlay designations are no longer needed, and they were removed from the map. Several overlays require zone change approval, while others are established on the zoning map. Two overlays – Airport and Gateways and Corridors – are established on the adopted zoning map. An overlay that requires zone change approval is the Multi-Family Cottage overlay. Development within all overlay areas must comply with the goals and policies of the underlying land use designation. Grove Field, an airport owned and operated by the Port of Camas-Washougal and located northeast of Lacamas Lake, adjoins the City’s boundary. The Airport Overlay is designated to ensure land uses adjacent to the airport are compatible with air traffic and do not interfere with safe air navigation. For example, the comprehensive plan designation of lands adjacent to the airport is generally industrial, rather than residential, and the Airport Overlay area restricts uses tending to high concentrations of people, such as schools or hospitals. This update designates gateways and corridors because Camas residents say they want the entrances to the City to be welcoming and identifiable. Community gateways create a sense of arrival and let visitors and residents know they are in Camas. A primary gateway is a main entry into Camas and includes a corridor, whereas a secondary gateway is limited to an intersection or a few city blocks. A corridor extends approximately 0.25 mile from a gateway and includes enhanced features such as bike lanes, widened or detached sidewalks, and signage. Table 1-3 identifies community gateways and corridors and the features that should be included in each gateway and/or corridor. Note: In addition to compliance with the standards established above, development within corridors and gateways must adhere to all applicable transportation and public works standards, including road cross-sections. Development/redevelopment within a designated gateway or corridor must adhere to the goals and policies included in the Economic Development Element as well as the applicable development regulations and design guidelines of the Camas Design Review Manual. An analysis of building permits issued since 2004 shows that 70 percent of new homes were over 3,000 square feet, with only 7 percent of homes less than 2,000 square feet. To address this disparity in housing, the MultiFamily Cottage Overlay provides an incentive to build smaller, single-level dwellings. The intent is to encourage the development of cottages, especially those with architectural elements typical of this type of dwelling such as a front porch, a steep-pitched gable roof, and a recessed garage. This overlay is also intended to accommodate those with mobility impairments. The dwellings must be less than 1,000 square feet, and are subject to design review approval. For additional goals and policies related to economic development, housing, and the environment, see Element 2 – Housing, Element 3 – Environment, and Element 6 – Economic Development. In 2035, residents of Camas continue to appreciate their safe, diverse, and welcoming community. Those who were raised in Camas will return for family-wage jobs and to ultimately retire here. Camas maintains its small town character while accommodating future residents. Camas is well known for its excellent schools, thriving businesses, and ready access to metropolitan amenities and natural features. A vibrant downtown and community events bring neighbors together and are enjoyed by all. Citywide Land Use Goal LU-1: Maintain a land use pattern that respects the natural environment and existing uses while accommodating a mix of housing and employment opportunities to meet the City’s growth projections. In 2035, the economy in Camas has grown to attract a variety of businesses that offer stable employment opportunities and family-wage jobs in the medical and high-tech fields. Camas is a gateway to nature and recreational opportunities, leading to a robust tourism industry. Professional office, medical, and industrial uses typify western Camas, with retail businesses supporting large campus firms. The North Shore area fulfills the employment and retail needs of a growing population on the northeast side and reduces trips outside the city. Downtown Camas retains its historic atmosphere as a walkable, attractive place to shop, dine, and gather. Employment Land Goal LU-2: Create a diversified economy and serve Camas residents and tourists by providing sufficient land throughout the City to support a variety of business types and employment opportunities. reduce car trips, but not at the expense of job creation. LU-2.5: Ensure industrial development and other employment lands are compatible with adjacent neighborhoods through development and landscaping regulations and design review. LU-2.6: Encourage the development of businesses that offer family-wage jobs and support the Cityâ&#x20AC;&#x2122;s vision for attracting medical and high-tech industries. commercial and industrial land to meet 20-year employment projections. LU-2.8: Ensure appropriately zoned land for the development of food retailers (grocery stores and farmersâ&#x20AC;&#x2122; markets) within a half-mile of residential areas. In 2035, Camas is a well-planned and connected City where residents enjoy pedestrian and bicycle paths between neighborhoods and to downtown. Historic structures are maintained and rehabilitated to accommodate new homes and businesses. There is a wide variety and range of housing for all ages and income levels. Neighborhood Goal LU-3: Create vibrant, stable, and livable neighborhoods with a variety of housing choices that meet all stages in the life cycle and the range of affordability. enhance access to recreation amenities. LU-3.6: Improve food access in residential areas that are farther than a half-mile from healthy food stores (grocery store or farmersâ&#x20AC;&#x2122; markets). resources and enhance the quality of life for Camas residents and visitors. transportation and physical activity. LU-4.4: Development on the edges of the City adjacent to unincorporated land in agricultural use or in a forested or natural state should consider those adjacent uses and, where appropriate, provide buffers. 1.4.5 Residential Mixed-Use Areas In 2015, mixed-use (MX) zoning in the City includes approximately 10 acres south of NE Third Avenue in the Louis Block Park Neighborhood. This area is dominated by small lots with an aging, single-family housing stock and future redevelopment is anticipated. The strengths of the area include its proximity to the historic downtown, regional trail connections, a large anchor grocery store, and the natural areas to the south and east. Future conversion of commercial or industrial areas to MX should consider the benefits to the community, such as providing a gathering place (e.g., pocket park), housing options for a variety of income levels, and job opportunities. Residential Mixed-Use Goal LU-5: To foster economically and socially diverse mixed neighborhoods as the foundation for a healthy city, which includes meeting the multi-modal transportation, housing, employment, education, recreation, and health needs of the citizens. to be compatible with surrounding land uses. LU-5.3: Densities in new mixed-use areas should not exceed the maximum densities allowed in multi-family zones. The Housing Element further identifies goals and policies to address the types and scales of the housing needed for the projected population. Vision In the year 2035, residents of Camas continue to appreciate their safe, diverse, and welcoming community. Those raised in Camas will return for family-wage jobs and to ultimately retire here. Camas is a well-planned and connected city where residents enjoy pedestrian and bicycle paths between neighborhoods and to downtown. There is a wide variety and range of housing for all ages and income levels. Housing Overview Camas provides a full range of housing opportunities to meet the needs of the people who call the City home. Neighborhoods are strong, and residents participate in community events and care about the livability and quality of life of their community. Housing in Camas ranges from residential estates on acreage to higher density apartments and a variety of single and multi-family housing types. While new development in Green Mountain and North Shore will add nearly 2,500 lots to the City and include a mix of housing types, additional housing is needed to support the growing population of seniors and those whose household incomes fall below the median. According to the GMA, the housing goal is to “[e]ncourage the availability of affordable housing to all economic segments of the population of the state, promote a variety of residential densities and housing types, and encourage preservation of existing housing stock.” To accomplish this goal at the local level, Camas should pursue opportunities to increase the supply and diversity of housing by converting existing houses, increasing the number of accessory dwelling units (ADU) (a.k.a., in-law apartments), and providing incentives for the development of a wider range of housing sizes and types (e.g., single-story, multi-story, and cottage). Regional cooperation is essential to assure adequate housing opportunities. Camas participates with the Vancouver Housing Authority, a local intergovernmental non-profit housing agency, to promote low- and moderate-income housing throughout the City. 2.3.1 Housing Needs As stated in the Land Use Element, GMA requires jurisdictions to accommodate their shares of the region’s projected growth. In 2035, the City is expected to have a population of 34,098 people, an 11,255-person increase from the 2015 population of 22,843. In order to accommodate this projected increase, the City will need approximately 3,868 new housing units. Furthermore, in order to maintain the overall City density of six dwelling units per acre, approximately 645 acres are needed to support a variety of housing typologies and styles. The goals and policies in section 2.4, as well as the goals and policies included in the Land Use Element, are established to ensure the City can accommodate the population increase and provide housing for all economic segments of the community. while in Camas, it was $81,897. 1 This number represents the midpoint of all household incomes, where half is above the midpoint and the other half is below. Table 2-1 below represents the affordable monthly housing costs for households with incomes ranging from 30 percent to 100 percent of the median household incomes for Clark County and Camas. If, for example, in Camas the household income is half (50 percent) of the median, the affordable monthly housing cost (30 percent of monthly income) would be $1,024. Table 2-1. Monthly Affordable Housing Costs Annual Household Income Monthly Affordable Housing Costs1 Clark County Camas Clark County Camas $17,202 $24,569 $430 $614 (30% of MHI) (30% of MHI) $28,671 $40,949 $717 $1,024 (50% of MHI) (50% of MHI) $45,873 $65,518 $1,147 $1,638 (80% of MHI) (80% of MHI) $57,341 $81,897 $1,434 $2,047 (100% of MHI) (100% of MHI) Washington Minimum Wage (2015) $19,697 $492 Note: Median Household Income (MHI) for Clark County = $57,341; for Camas = $81,897. 1 30% of monthly income, inclusive of utilities and taxes and insurance for ownership housing. In Washington, the fair market rent for a two-bedroom apartment is $1,128. 2 In order to afford this level of rent and utilities – without paying more than 30 percent (affordable cost) of income – a household must earn $3,760 monthly or $45,119 annually. Assuming a 40-hour work week, 52 weeks per year, this translates to an hourly wage of $21.69 per hour. In 2015, the minimum wage in Washington is $9.47 an hour, less than half the wage required to afford the fair market rent for a two-bedroom apartment. As illustrated in Table 2-1, there is a discrepancy between annual income and the cost of housing which exceeds the affordable thresholds. During the course of the public forums for this comprehensive plan update, citizens expressed concern that residents at both ends of the life spectrum – young professionals returning from college and retiring seniors – do not have affordable housing options. The Housing Element responds to these concerns with goals and policies for the development of housing that meets the needs of the full spectrum of income levels in the City. There are a number of factors that contribute to the cost of housing: the availability and cost of the land, the cost of the necessary infrastructure, the topography of the site, and the cost of building (including fees and permits). Additional factors that command a higher price of housing include the reputation of the Camas School District as one of the best districts in the region. For example, the Camas High School graduation rate in 2014 was 93 percent compared to 76 percent statewide, and the school was ranked 23 of 458 high schools in the state by US News & World Report (2015). Because of the difficulty of creating affordable housing, it is important to maintain affordability for as long as possible in existing affordable housing and new housing built with public funding. Through various options such as flexible lot sizes, development agreements, and covenants, assurances can be made that housing will remain affordable and will target affordability for the life of the development or the zoning of the property. Additionally, all new housing developments of significant size should create a balance of housing types and densities in order to increase affordable housing throughout the community. Senior and Special Needs Housing According to the U.S. Census Bureau, “[b]y 2030, one in every five people living in the US will be over the age of 65. This aging of America is fueled by 72 million baby boomers aging through the life cycle in combination with a profound increase in longevity. Average life expectancy doubled from the mid-thirties in the 19th century to age 78 today .” In general, special needs populations include people who might require some assistance in their day-to-day living, such as people who are physically or mentally disabled, victims of domestic violence, and at-risk youth. The City encourages efforts to provide for those needs and to require a percentage of new housing developments to include universal design accommodations. Special needs housing should be integrated into Camas neighborhoods and have easy access to public transportation, shopping, medical facilities, and other essentials. 2.4.1 Citywide Housing Citywide Housing Goal H-1: Maintain the strength, vitality, and stability of all neighborhoods and promote the development of a variety of housing choices that meet the needs of all members of the community. through the land use approval process and stipulated on the final plat. 2.4.2 Affordable Housing Affordable Housing Goal H-2: Create a diversified housing stock that meets the needs of all economic segments of the community through new developments, preservation, and collaborative partnerships. assess the need for additional units. Develop policies to implement recommendations of the affordable housing study. 2.4.3 Senior and Special Needs Housing Senior and Special Needs Housing Goal H-3: Encourage and support a variety of housing opportunities for those with special needs, particularly those with challenges relating to age, health, or disability. through the Multi-Family Cottage Overlay or other tools. The Natural Environment Element provides a policy framework for the protection and improvement of Camasâ&#x20AC;&#x2122; natural environment, an important element for the development of a sustainable city. Vision In 2035, Camas appreciates and remains good stewards of its natural environment. A vegetated corridor provides habitat and safe passage for wildlife from Green Mountain to the Columbia River. Lacamas Lake is treasured as a unique and pristine resource. City policies preserve trees and natural areas. Goals and Policies These goals and policies are established to ensure the preservation of the natural environment, consistent with the Camas 2035 Vision. Goals and policies are presented for environmental stewardship, critical areas (wetlands, critical aquifer recharge areas, frequently flooded areas, geologically hazardous areas, fish and wildlife habitat conservation areas, and historic and cultural resources), shorelines, and landscape enhancement and tree preservation. 3.4.1 Environmental Stewardship One of the most demanding roles the City of Camas must fulfill is that of chief steward of the city's environment. The City has the authority to regulate land use and the responsibility to implement federal and state statutes. Therefore, the City must endeavor at all times to ensure that its environment is managed wisely. The City encourages the preservation, restoration, and improvement of the natural environment in all development. Environmental Stewardship Policies NE-1.1: Consider the immediate and long-term environmental impacts of policy and regulatory decisions. NE-1.2: Supply quality services to the community while ensuring resource conservation and ensure an environmentally safe workplace for City employees. NE-1.3: Prepare, plan, and provide ongoing training for those responding to adverse environmental events. NE-1.4: Establish citywide multi-modal connectivity to encourage non-motorized transportation in order to protect the City’s air quality. NE-1.5: Protect, conserve, and manage existing natural resources and valuable historic and cultural areas in order to ensure their long-term preservation. NE-1.6: Encourage the preservation of the night sky through dark sky standards in development regulations and design guidelines. NE-1.7: Limit clearing, grading, and soil disturbance outside building footprints in order to maintain the natural hydrologic functions of a site. NE-1.8: Encourage the development of grading regulations that preserve the natural contours of undeveloped properties, natural vistas, and mature vegetated corridors. 3.4.2 Critical Areas The critical areas goal and policies are intended to protect critical areas as identified by GMA. Camas’ natural environment is composed of a variety of landforms, soils, watercourses, and vegetation. Protection and, where appropriate, restoration of these critical areas will ensure the preservation of Camas’ natural environment and contribute to Camas’ quality of life. Development on property that contains critical areas must comply with the goal and policies listed below, as well as the development regulations contained in CMC Title 16. Critical Area Goal NE-2: To preserve, maintain, and restore the City’s critical areas to protect their function and values. practicable, restore the biological health and diversity of Camas’ critical areas. NE-2.2: Preserve, and when appropriate, restore, aquatic and riparian habitats consistent with applicable regulations. NE-2.3: Conserve and protect groundwater resources. NE-2.4: Regulate land use and development so as to protect natural topographic, geologic, vegetative, and hydrologic features. NE-2.5: Promote soil stability through the use of the natural drainage systems and protection of existing native vegetation. NE-2.6: Minimize and control soil erosion during and after construction by using best management practices, best available science, and ecologically sustainable site design. NE-2.7: Preserve and avoid areas with endangered, threatened, and sensitive species and species of local importance as required by local, state, and federal laws. NE-2.8: Ensure that development throughout the City meets or exceeds standards and practices for long-term wetland protection and mitigation. Planning Commission and City Council sessions. The City also created an ad hoc committee to examine the proposed amendments and ensure that the locally significant policies remained intact. The Camas Shoreline Master Program was amended in 2012 with Ordinance 2643 and Resolution 1250. A limited amendment to the wetland regulations was adopted in July 2015 with Ordinance 15-007.
restoring shorelines that have been impaired or degraded. 3.4.4 Landscape Enhancement and Tree Preservation The natural landscape and existing tree cover are important aspects of Camas’ natural environment. Native, mature landscaping and trees contribute to the City’s ecological health, supply valuable animal habitat, and enhance the community’s natural beauty. Landscape Enhancement and Tree Preservation Goal NE 4: To protect Camas’ native landscape and mature tree cover. management of urban forest areas. Tâ&#x20AC;&#x2039; he quality of life for many people is significantly affected by how well streets function for pedestrians, bicyclists, transit riders and motorists. The Transportation Element must balance the needs of all users. Vision In 2035, residents of Camas continue to appreciate their safe, diverse, and welcoming community as a livable place for people of all ages. Quality public facilities, services, and utilities contribute to their high quality of life. Transportation Overview The quality of life for many people is significantly affected by how well streets function for pedestrians, bicyclists, transit riders, and motorists. The Transportation Element must balance the needs of all users. The basic roadway system providing circulation to and from Camas is the federal and state highway system – Interstate 5, Interstate 205, State Route 14 (SR), and SR 500. The interstates link Camas and surrounding areas to Portland to the south as well as Olympia and Seattle to the north. SR 14 is the major east-west connection from Camas to I-205 and I-5. SR 500 provides access to the northern parts of the county. The City coordinates with CTRAN, the area’s public transit provider, for transit stops and access. The City recognizes the importance of coordinated and strong inter-jurisdictional action because transportation impacts do not stop at local boundaries. Amidst increasing congestion and limits on public resources, interjurisdictional coordination is necessary if the region is to achieve the land use and transportation vision contained in the Clark County Countywide Planning Policies. The City is a member of the Regional Transportation Council (RTC) and uses a regional model to project future trips based on proposed land use designations and projected population. This practice resulted in establishing the transportation elements needed to meet the level of service (LOS) standards throughout the City. Transportation planning and operation priorities are found within the following documents, which are intended to support the goals and policies in this comprehensive plan update. • Design Standards Manual (annual updates): This manual contains engineering design standards for the construction of roads, erosion control, grading, storm, sewer, water, and landscaping in the right-of-way. • City of Camas Six Year Street Plan (annual updates): This list of street projects is organized in priority order. • Traffic Impact Fee (TIF) Update (May 2012): The update identifies the areas impacted by projected growth and determines the transportation facility improvements needed to accommodate it. 4.4.1 Streets Street Goal T-1: Streets will function for all users including bicyclists, pedestrians, transit users, and motorists. speeds, and multi-modal safety. T-1.6: Minimize access to new development and redevelopment along the Cityâ&#x20AC;&#x2122;s arterials, and consolidate access points when spacing is insufficient. T-1.7: Include enhanced roadway features such as roundabouts, decorative lighting, and landscaping for gateways. 4.4.2 Walking, Bicycling, and ADA Mobility Walking, Bicycling, and ADA Mobility Goal T-2: The needs of bicyclists, pedestrians, transit users, and accessibility (ADA-compliant) will be considered in all street improvements and will be integrated in all collector and arterial roadway projects, including regular safe street crossings. residential areas, schools, and public facilities. T-2.6: Increase wayfinding signage for outdoor destinations throughout the City. T-2.7: Support enhanced pedestrian improvements in the downtown and other economic development areas. Complete Streets are designed to provide safe access for all users (pedestrians, bicyclists, motorists, and transit riders of all ages and abilities). 4.4.3 Local and Regional Transit Local and Regional Transit Goal T-3: Regional transit will provide safe, efficient, and dependable service to our community. counties, and C-TRAN to ensure that minimum roadway and multi-modal design standards are consistent. T-3.2: Continue to advocate for quality regional transit services and an increase to service availability. 4.4.4 Design and Low-Impact Development Design and Low-Impact Development Goal T-4: The transportation system will be designed to support community character and environmental policies. 4.4.5 Safety and Traffic Calming Safety and Traffic Calming Goal T-5: Design and construct safe transportation facilities that meet applicable requirements. in development. T-5.5: Require new developments to implement design standards using the Neighborhood Traffic Management Plan. T-5.6: Identify high accident areas, and implement specific measures to reduce their occurrence. 4.4.6 Transportation Demand Management The City studies corridor and traffic impact fees to plan transportation management that keeps pace with growth projections. Growth assumptions are based on the RTC travel demand model. The demand management projects are included in the annual update of the Cityâ&#x20AC;&#x2122;s list of capital improvement projects. carrying capacity, and accommodate and facilitate future growth consistent with land use objectives. Transportation Demand Management Policies T-6.1: Require large employers to implement a commute trip reduction program for employees, as mandated by the stateâ&#x20AC;&#x2122;s Commute Trip Reduction law. T-6.2: Develop Complete Street design that is supportive of the use of alternative modes of travel and adopt engineering design standards consistent with these goals. T-6.3: Support intergovernmental development review. T-6.4: Support RTC with funding and staff participation to the extent possible. 4.4.7 Concurrency and Level of Service Concurrency and Level of Service Goal T-7: The City will maintain the adopted LOS standards for all arterials, transit routes, and highways. deficiencies and plan improvements to maintain or improve level-of-service standards. T-7.4: The City strives to maintain a LOS standard during peak hours as follows. The following table is based on the most current Highway Capacity Manual (HCM) of the Washington State Department of Transportation. • Delay development until programs, facilities, or services can be funded; • Obtain needed revenue or revise the transportation plan to reflect known financial resources. • As a last choice, change the transportation LOS standard. 4.4.8 Transportation Revenue The City’s transportation budget provides for capital improvements and the operation, maintenance, and preservation of the street system. The City also must plan for that portion of the improvements that is not funded by state or federal grants or loans and developer contributions. The budgeting decisions must include an analysis of the benefits and costs for priority areas. Transportation Revenue Goal TR-8: Maximize the use of state and federal funds for transportation capital, operating, service, and demand improvements. facilities and efficient use of public funds. circulation within and between infill areas, schools, and employment centers within City limits. T-8.6: Focus transportation projects in economic development areas to act as catalysts for job growth. Multi-Year Financing Plan In previous years, the City relied heavily on Public Works Trust Fund loans, which are not currently available. The financing of capital transportation projects is prioritized along with the list of projects in the capital improvement plan, which is projected as a long-range plan for funding. The current capital improvement plan comprises Appendix D. Revenues for roadway-related activities come from the following sources: â&#x20AC;˘ General County revenue (e.g., property tax), â&#x20AC;˘ Impact fees, and â&#x20AC;˘ Distribution from state and federal sources (e.g., state gas tax allocations). The City provides police, fire, and ambulance services as well as library services, water and sewer services, animal control services, and parks and recreation programs and facilities. The City also manages the City cemetery. Vision In 2035, Camas continues to have an excellent school system, an asset that draws families to the community. Students and their families enjoy the city’s parks, trails, community centers, and other recreational opportunities. The library continues its vital role as a place of learning. Residents value well-funded police, fire, and emergency response services. Proficient government agencies maintain existing City assets and coordinate future development. Public Facilities and Services Overview The City provides manifold services to its residents. They include police, fire and ambulance, library, water, solid waste, and sewer services. The City also constructs and maintains parks and recreation facilities. In addition, the City issues building and development permits and manages the City cemetery. While the City also constructs and maintains streets and other public improvements, transportation is a standalone element and is not included in the Public Facilities and Services Element. This element includes the goals and policies for public facilities and services to be provided concurrent with anticipated growth. The element also identifies strategic plans and actions to maintain or improve services. The identified goals and policies were given consideration based on a framework of budgetary and operational guidelines as described throughout this element. Fire Protection and Emergency Medical Services The Camas-Washougal Fire Department (CWFD) covers 20 square miles and 33,000 residents for fire protection and approximately 80 square miles and 65,000 residents for paramedic services. On July 13, 2011, the Camas and Washougal fire departments were consolidated into one agency through a contract for service. Under this agreement, the departments operate under one chief and combine all operational staffing in an effort to improve efficiency and lower expenditures. CWFD averages approximately 5,000 fire and medical calls annually. The CWFD is the only fire department in Clark County that provides ambulance transport services. This added responsibility requires our firefighters to be highly skilled in emergency medical services along with fire suppression techniques. CWFD services include fire suppression, public education, inspection, prevention, and code enforcement activities. encourage their use when installation is optional. FE-4: Seek the appropriate funding levels to maintain fire facilities to include all fire apparatus at levels to best serve the community. Fire apparatus means (and includes) fire suppression equipment such as engine, water tenders, brush trucks and command officer vehicles. FE-5: Maintain the requirement that all new residences install fire sprinkler systems. Police Protection The Camas Police Department operates a full-service police department from one location at 2100 NE 3rd Avenue, just east of the downtown core. This facility was built in 1998 and is 15,000 square feet in size. Included in the facility is a 1,500-square foot community/training room. The facility is served by a backup generator. 5.5.1 Police Protection Policy PP-1: Plan police annex facilities at strategic locations; these are preferred over a separate, new full service police facility. Camas Public Library Since 1929, the City of Camas has maintained an independent municipal library. Camas chose to keep its library when the Fort Vancouver Regional Library (FVRL) was established in the 1960s. FVRL is a junior taxing district that serves Clark, Skamania, and Klickitat counties and the City of Woodland in Cowlitz County. The Camas Library building, constructed in 1940, was fully remodeled in 2002, with 27,000 square feet of space to provide access to books, CDs, DVDs, and other materials. The expanded library space includes meeting rooms, study spaces, and an art gallery. The library also has more than 20 computers and free Wi-Fi for public use. The library has additional support from the Friends & Foundation of the Camas Public Library. This non-profit group is a source of volunteers and raises funds for items not covered by the City budget in order to sustain the library’s high level of service. The library’s physical collection contains more than 100,000 items including books, DVDs, CDs, and portable MP3 players. The library’s online collection includes thousands of eAudio and eBooks, digital magazines, and over 30 research databases that are available any time from any device. The library expands its collections through a cooperative partnership with the FVRL. The library is a member of the Metropolitan Interlibrary eXchange (MIX), so residents of Camas can go to a library in Multnomah, Hood River, Washington, or Clackamas counties in Oregon and use those libraries for free. Additionally, through World Cat, the library provides access to the holdings of Washington libraries and libraries around the globe. 5.6.1 Camas Public Library Strategic Plan The library’s future is outlined in its strategic plan, which is generally updated every 3 to 5 years. The current plan was adopted on February 2, 2012 (see Appendix E). 5.6.2 Policies and Recommended Actions CPL-1: Plan and construct a library to serve the west side of the City, in the area of Green Mountain. CPL-2: Explore opportunities for furthering regional cooperation, not limited to consolidation with FVRL. Parks and Recreation Facilities Camasâ&#x20AC;&#x2122; parks and recreation facilities include the Lacamas Lake Lodge and Conference Center, Camas Community Center, Camas Municipal Pool, Scout Hall, 14 parks, 22 miles of trails, and over 600 acres of open space. Camas has a highly developed park system that supports a broad range of recreation interests. As confirmed through the public involvement process, the community places a high value on its park system and is interested in adding recreational facilities to supplement the existing offerings. 5.7.1 Parks and Recreation Facilities Comprehensive Plan In December 2014, the City adopted a comprehensive plan for parks and recreation facilities (see Appendix F). The Parks, Recreation and Open Space Comprehensive Plan Update (PROS) includes goals and objectives related to physical park planning, management and operations, recreation programs, and public involvement. The focus of the 2014 PROS plan was to maximize the use of existing sites and facilities, while targeting locations where new parks are needed to serve areas of planned growth. 5.7.2 Parks and Recreation Goal and Policies Parks and Recreation Goal Preserve and enhance the quality of life in Camas through the provision of parks, recreation programs, recreational facilities, trails, and open spaces. Park Policies and Recommended Actions The PROS document includes a detailed list of future park and recreation projects and services. Section 6 of the PROS plan describes park operations and standards for maintenance. Section 7 includes a list of project priorities, potential funding sources, and a 6-year park capital improvement plan. The development of new indoor recreation space and aquatic facilities (e.g., community center) is one of the top priorities listed in this section of the plan (refer to the PROS plan, page 7-3 Project Priorities, and page 3-11). 5.7.3 Park Impact Fees With economic recovery in progress, the speed of new development, particularly within the expanded City limits in the North Shore area, will increase. Camas receives impact fees paid by new development for park, trail, and open space improvements that increase the capacity of the system. The expenditure of the collected fees will be applied to the total costs of implementing projects that are identified in the PROS Plan project list, and as further refined by the Cityâ&#x20AC;&#x2122;s Capital Improvements Plan. City Cemetery The Camas Cemetery is an important historic and aesthetic resource for the City of Camas. Located adjacent to Lacamas Park, it is a peaceful resting place for our loved ones, a quiet place for reflection, and an addition to our open space network. The City of Camas 2009 Cemetery Master Plan was developed to support this important resource and guide the City’s efforts to manage the cemetery. In 1883, the Camas Colony Company, formed by Henry Pittock, the publisher of The Oregonian, and a group of investors, sought land near La Camas Lake (Lacamas Lake) on which to establish a newsprint-producing paper mill. The company platted the cemetery in 1885, shortly after establishing the mill, but their temporary layout markers and plats were lost. Although there is uncertainty over the early years, many believe the land the cemetery now occupies was originally owned by Donald Stearns, a close associate of Pittock. The Women’s Civic Club maintained the affairs of the cemetery from 1910 through 1914. In 1914, a deed was recorded giving ownership of the cemetery land to the recently incorporated City of Camas, granted by the Pittock and Leadbetter families. The City operated the cemetery for 6 years until the Camas Cemetery Association was formed; the association operated the cemetery for more than 80 years, doing most of the work in creating what we know today as the Camas Cemetery, Ownership and operation came full circle and were transferred back to the City of Camas in 2007. Throughout its history, several local cemeteries have incorporated their graves into the Camas Cemetery. The Camas Catholic Cemetery relocated a number of its graves and erected a memorial listing the names of all those moved. Many other graves were also relocated to the Camas cemetery over the years, including one of the oldestdated headstones, belonging to the Karnath family. 5.8.1 Cemetery Operations and Maintenance The City’s Parks maintenance crew maintains the grounds, marks the gravesites, inspects the sites after service, and marks out and inspects marker installation. The crew also inters remains in a grave plot or niche wall without a service, and, along with the Finance Department, administers lot sales. Burials that involve a service, headstones, and markers are the responsibility of the funeral home. The City provides a license (revocable grave digging permit) for contractors to dig graves and place markers under the supervision and authority of the funeral home. The data below list general information as of August 2015: • 5,731 burials to date. • 470 cremated remains placed in lots or niche walls. Based on observed data base errors, this number is presumed to be low. • 827 veterans interred in the cemetery, according to the Veterans of Foreign Wars, which maintains data about the burials of veterans. Over 1,500 lots are currently available for purchase at the Camas Cemetery. 5.8.2 City Cemetery Policies CEM-1: Develop a robust and trustworthy database of burial information. CEM-2: Meet residents’ service expectations. CEM-3: Make the cemetery financially stable and reduce dependency on the general fund. CEM-4: Maximize the developed and undeveloped property for cemetery use to meet future burial needs and trends and provide economic stability to the cemetery fund. CEM-5: Develop a strong volunteer and donation program. Animal Control Services The City has contracts with the City of Washougal for animal control services in Camas. Dog owners in Camas are required to pay a one-time lifetime license fee (CMC 6.08.030), which means that the license does not need to be renewed annually as is typical in other jurisdictions. 5.10 Other City Facilities Other City-operated buildings include the Camas Municipal Center and the Operations Center. Located downtown at 616 NE 4th Avenue, the Camas Municipal Center, constructed in 1967, houses a number of general governmental services in approximately 25,000 square feet of space. These services include administration, building, engineering, finance, planning, and public works. The east end of this building serves as a fire and EMS station. Space for meetings, whether small staff meetings or larger public events, is at a premium. Expansion plans should include flexible space that could be used for both purposes. governmental services occurs, the current facility will not accommodate additional personnel. OCF-2: Consider additional meeting spaces for staff and the public when designing an expansion or building a new facility. OCF-3: Ensure that the municipal building and primary services remain downtown, in the heart of the City. 5.11 City Utilities City utility services include water, sewer, stormwater, and solid waste disposal. 5.11.1 General Utilities General Utility Goal Provide utility services to all businesses, residents, and properties in the City limits. In urban areas, eliminate private water and sewer/septic systems, including wells used only for irrigation. 5.11.2 Water Services The City’s current Water System Plan (see Appendix G, adopted June 2010) provides the overall framework for managing and expanding the water system. The City is drafting an update to the plan, which should be adopted in 2016. The updated report will describe the existing water supply and distribution system, as well as proposed improvements necessary for serving the land in the north and west portions of the study area that either have been, or are proposed for, annexation to the City. The City owns and operates a Class A water system which, in 2014, served 7,928 customers. The system obtains water from two surface water sources (Jones Creek and Boulder Creek, which are located on the south side of Larch Mountain, northeast of the City) and from ten wells. All water is treated with chlorine for disinfection, fluoride for dental health, and sodium hydroxide to reduce the corrosion of copper piping to meet state and U.S. Environmental Protection Agency (EPA) standards. Water pressure and fire flows are maintained throughout the service area with seven distribution reservoirs totaling 8.45 million gallons of storage capacity, nine booster pump stations, and over 140 miles of pipe. Because of the City’s varied topography, there are five main pressure zones and 11 secondary pressure zones located throughout the City. The City currently has municipal water rights issued by the Washington State Department of Ecology (Ecology) for two surface water sources and nine groundwater sources. The combined water right on instantaneous quantity basis (Qi) from all of the City’s sources is 14,045 gallons per minute (gpm). The annual withdrawal allocated to the City is 11,090 acre feet. 4 The City’s water system is depicted on the water system map included in Appendix G.
5.11.3 Surface Water The surface water from Jones Creek and Boulder Creek is used to supply water to the City from November 1 through May 14. These water sources are used during that time to minimize the pumping required from groundwater sources. The low silica characteristics of the surface water also make it very desirable for use by hightech manufacturing facilities. A new slow sand filter water treatment plant began construction in 2015 and was completed in 2016. The new plant will replace the existing surface water disinfection system and the water filtration plant located near Lacamas Lake that was taken out of service in 2010. The new plant and transmission facilities ultimately will be capable of providing approximately 2.2 million gallons of water per day. The Jones Creek and Boulder Creek watershed consists of approximately 1,700 acres of mature forest land that is used by the City to collect water through water intake facilities. The City acquired this property in five individual transactions between 1923 and 1950. The property is generally split into two principal drainage basins, with Boulder Creek draining the westerly half and Jones Creek draining the easterly half. Both creeks are large streams that have public water intakes and are fed by numerous tributaries. A forest management plan has been established for the property and prescribed logging in the watershed began in 2014. Other transmission improvements and maintenance activities necessary to operate the water intake facilities have been constructed or are under design. 5.11.4 Groundwater Wells The City operates 10 groundwater wells. Wells 7, 8, 10, 11, and 12 are located on SE Sixth Avenue, in the eastern downtown area, and are referred to as the Washougal Wellfield. Well 6 and Well 14 (completed in 2010) are located farther east along SE Sixth Avenue near the Camas/Washougal border. Well 5 is located south of Well 6 on SE Eighth Street. Well 9 was completed in August 2000 at a capacity of 650 gpm and is located on NW 38th Avenue near Parker Street. Well 13 was completed in June 2008 and is located just south of downtown on First Avenue. Wells 1, 2, 3, and 4 are abandoned. Level of Service Criteria for Water Services The 2011 Clark County Coordinated Water System Plan Update, along with the City’s Design Standards Manual, are used to guide the design and construction of the water system. The City is updating its water system plan with an adoption date in 2016. The current plan (adopted June 2010) provides the overall framework for managing and expanding the water system. An acre-foot is the volume of 1 acre of surface area to a depth of 1 foot. According to the Water Education Foundation (http://www.watereducation.org/general-information/whats-acre-foot), covering 1 acre to a depth of 1 foot would require about 326,000 gallons of water. Current Deficiencies/Excess Capacity of Water Services The Camas water system meets or exceeds the LOS criteria identified above with limited exceptions. Because of the City’s varied topography, limited pockets periodically have water pressure in excess of 100 pounds per square inch (psi). Adequate storage and treatment is available to meet the on-going needs of the City. System improvements are scheduled to maintain this LOS. The City undertakes an update of the water system plan every 6 years per Department of Health regulations, and an update is anticipated to be completed in late summer 2016. Water Services Policy WS-1: Extend adequate public water service throughout the City’s urban areas. An adequate public water system is one that meets Washington requirements and provides minimum fire flow as required by the Fire Marshal. WS-2: Provide safe, clean, high quality drinking water to residents. WS-3: Ensure water infrastructure is designed to City standards and is in place prior to land development. WS-4: Maintain sole responsibility for providing water within the UGA, and require that all new construction connect to the City’s system. WS-5: Coordinate with Clark County or other purveyors to eliminate private systems in accordance with the Clark County Coordinated Water System Plan (2011). WS-6: Coordinate with the County and the cities of Vancouver and Washougal to protect groundwater from contamination. 5.11.5 Sewer System and Service The City owns and operates a secondary sewage wastewater treatment plant (WWTP), over 100 miles of sanitary sewer piping, 23 pump stations, and over 3,200 individual septic tank effluent pumping/gravity systems. The sewer system served 7,368 customers in 2014. All domestic, commercial, and industrial waste flows are treated at the WWTP. The plant is a conventional activated sludge treatment plant built in 1972 and upgraded in 2000 and again in a phased expansion in 2010 through 2014. The WWTP has a maximum monthly average flow of 6.1 million gallons per day (mgpd), and a peak hour flow rating of 13.44 mgpd. The City’s public sewer system is depicted on the sewer system map included in Appendix H. The WWTP consists of primary screens, primary clarifiers, aeration basins, secondary clarifiers, ultra-violet disinfection, effluent filters, and anaerobic digesters. The effluent from the WWTP is discharged into the Columbia River. The sewage collection system generally comprises two types of systems. The first is a standard gravity collection system where residential, commercial, and industrial sewage is collected through a series of ever-larger gravity lines and directed to the WWTP. The second is a septic tank effluent pumping (STEP) system where each residential, commercial, or industrial customer has its own septic tank and pump. Solids are collected in the septic tanks, which are owned and maintained by the City. Solids are pumped out of the septic tanks approximately once every 8 years. The sewer effluent (liquid) is pumped from each individual tank into a larger system of force mains and pumps and directed to the WWTP. Sewer Level of Service Criteria The sewage disposal system and treatment plant serving the City are designed and regulated in accordance with the Criteria for Sewage Works Design Manual issued by the Department of Ecology. The manual guides the design of sewage collection and treatment systems. The 2007 General Sewer/Wastewater Facility Plan and the associated 2015 General Sewer Plan Amendment provide the overall framework for managing and expanding the sewer collection system and the WWTP. Additionally, the plan and amendment include information about the system, the capital improvement plan, and the finance plan. Current Deficiencies/Excess Capacity Collection System – The capacities of the City collection system pipelines and pump stations are adequate to serve existing flow rates. Capacity expansions will be necessary as the area’s tributaries to each sewer basin continue to develop. Pump station and pipeline expansions are guided by the General Sewer Plan (Appendix H), and by actual loads and flows entering their respective sewer basins. Wastewater Treatment Plant The WWTP underwent an extensive phased upgrade which was completed in 2014, expanding its capacity to meet the 2025 population projections based on the 2007 Comprehensive Plan. Future upgrades are identified in the General Sewer/Wastewater Facility Plan and in the 2015 Amendment to provide service to the full build-out of the UGA. Sewer Infiltration/Inflow Analysis An infiltration/inflow (I/I) analysis was conducted with the 1997 City of Camas Wastewater Facilities Plan to identify and prioritize the inflow of groundwater into the sewer system. An updated analysis was completed in 2015 and 2016. This is an important element to control and reduce as increased flow due to rainfall or high groundwater uses needed capacity at the WWTP and makes the influent more difficult to treat. Since 1998, the City has invested in removing the major sources of I/I identified in the study and has a plan to continue the I/I reduction program. serve future customers to the greatest extent possible. SS-3: Coordinate with Clark County to eliminate septic systems. 5.11.6 Stormwater Drainage The City owns and maintains a stormwater conveyance system that drains approximately 7,500 acres. This storm system includes approximately 75 miles of stormwater conveyance pipe, 1,800 stormwater inlets and catch basins, and approximately 25 City-owned treatment and detention facilities, including underground treatment vaults, detention ponds, biofiltration swales, and wet ponds. The system also includes numerous culverts and drainage channels. All stormwater pipelines are separate from the City's sanitary sewer system. The City has a longstanding policy of requiring commercial and residential stormwater facilities to be privately owned and maintained. As part of its March 2010 stormwater code update, the City retained this policy and codified it under CMC 14.02.200 Ownership and Maintenance. As such, there are approximately 110 private stormwater facilities within its boundaries. The City’s stormwater management area includes three major watersheds: the Columbia River, the Washougal River, and the Lacamas Lake watersheds. All surface water and piped stormwater conveyance systems drain to one of these water bodies through a network of interconnected drainage channels, creeks, and storm pipes. Each of these main drainages has distinct and important sub-basins that have critical collection points. The City became a Phase II National Pollutant Discharge Elimination System (NPDES) permittee in 2007. The City must meet all management and maintenance requirements outlined in its NPDES permit and the permit requirements continue to get more stringent and consume more of the City’s resources. The City created a stormwater utility in 1989 and continues to refine the utility goals and rate structures to meet the permit requirements and serve the community. Stormwater management strategies are designed to meet the City's goals and objectives as described in the City’s 2013 Comprehensive Stormwater Drainage Plan (Appendix I). The key strategy relating to stormwater is to support economic development while protecting the environment. More recent requirements through the City’s NPDES permit require all development to consider, and use where possible, LID strategies. The City is drafting LID regulations for adoption in 2016. The City storm drainage system is shown on the storm drainage system map included in Appendix I.
Stormwater Policies SW-1: Provide a stable funding source to meet NPDES Phase 2 requirements. SW-2: Inspect homeowner association and other private facilities, and provide directions and standards for repair. SW-3: Meet water quality standards by providing best management practices for development activities. SW-4: Establish baseline flows on each drainage basin or sub-basin for the analysis of deficiencies. SW-5: Develop standards that would reduce the amount of impervious surface on new construction, including the creation and adoption of LID standards. Manual and design criteria. SW-7: Protect natural stream courses for water quality. SW-8: Manage stormwater to safely pass surface water and maintain water quality of lakes, streams, and rivers. 5.11.7 Solid Waste The City owns and operates its own solid waste utility which provides for the collection and transfer of solid waste refuse to the Clark County-owned Washougal Transfer Station. The City is responsible for managing garbage collection within the Camas boundaries. The City has established universal compulsory solid waste collection, requiring all residents and businesses to maintain solid waste service. The City contracts with Waste Connections of Washington to provide recycling and yard debris management, collection, and disposal. The City also contracts with Waste Connections to provide large container service (larger than 2 cubic yards) to account holders with greater solid waste handling needs. All cities and towns in Clark County have delegated responsibility for solid waste transfer and disposal planning to the County through 2021, including Camas. The adopted Clark County Solid Waste Management Plan (CSWMP) of 2015 is updated regularly and reviewed by the County Solid Waste Advisory Commission. Agreements between Clark County and its cities commit each to the plan and to the plan’s waste disposal system. Counties and cities in Washington are required by RCW 70.95 to: • Prepare and maintain coordinated comprehensive solid waste management plans • Determine the nature and extent of various solid waste streams (for example, from households, industries, offices, etc.) • Establish management strategies for the handling, utilization, and disposal of solid waste • Identify waste reduction, source-separated recycling, and waste separation programs as priority management tools Waste Connections of Washington is responsible for managing collection services within the Camas boundaries for recyclable materials. There are no permanent solid waste facilities within the City of Camas; facilities are located throughout the County. Clark County entered into a 10-year contract with Columbia Resource Company (CRC), owned by Waste Connections of Washington, in 2010 to recycle solid-waste materials collected and delivered to transfer and recycling stations, with the remaining non-recycled wastes transported for final disposal to CRC’s Finley Buttes Landfill. Waste is compacted into intermodal containers and transported upriver by private barge, then trucked to the landfill. Over half of the waste generated in the County is recycled or recovered, with the remainder disposed of in landfills. In 2012, the total waste stream for the County was 665,766 tons, of which 359,169 tons were recycled, or 53.9 percent. Since 2003, pounds per person per day landfilled has declined from 3.40 to 2.94 pounds, similar to the national rate of 2.90 pounds per capita landfill disposal. However, even as the percentage of waste that is recycled has increased, the total waste per capita—recyclable and nonrecyclable—has also increased, requiring additional resources to collect, sort, transfer, and convert to a recycled product or landfill. Total waste generation is expected to continue to increase in Camas and across the county as the population grows. The County has projected a 1.3 percent increase in total waste per year, including a 1.6 percent increase in landfill tonnage and a 2 percent increase in residential recycling tonnage. At these rates, the County projects an increase from 665,766 tons total waste countywide in 2012 to 789,819 tons in 2034. Camas’s total waste generation can be expected to increase at a higher rate due to the higher population growth rate forecasted for the City relative to the County. The County has evaluated the capacity of its transfer stations and landfills and concluded that they can accommodate the projected waste increase through 2034. The CSWMP establishes several overall goals for waste management over the 2015-2020 timeframe including: • Increase recycling rate to 55 percent and the total diversion rate to 70 percent. • Reduce per person per day landfilled volumes by 5 percent. • Reduce total amount of waste generated per person per day by 5percent. Camas will work with the County towards these goals by implementing the specific objectives of the CSWMP. Solid Waste Policies SOW-1: Provide for solid waste service throughout the City through continuance of self-collection of solid waste and contracting with private waste management companies to provide recycling and yard debris collection options. SOW-2: Continue a system of universal compulsory solid waste collection. SOW-3: Implement the CSWMP. Reduce the total production of waste, increase the recycling rate of waste that is produced, and properly manage and dispose of waste that is not recycled. Provide education and outreach to businesses and the public on benefits and opportunities for waste reduction and recycling. Focus on residential recycling rates to improve participation rates similar to the rest of the County. Capital Fund. CIP-5: Dedicated funds and bonds may be used to fund essential capital improvement projects such as police, fire, and general municipal structures. CIP-6: Use voted, general obligation debt for discretionary projects such as recreation and library facilities. CIP-7: Give priority to those projects that support the core services provided by the City. CIP-8: Assure consistency of capital improvement plans with the adopted Comprehensive Plan map and evaluate if funding is adequate to provide necessary public facilities and services to implement the plan. 5.12.2 Capital Improvement Plan – Project List (2016–2035) The list of capital improvement plan projects is a complete catalogue of all projects that have been identified in various planning documents. The implementation dates and associated costs listed for the projects are tentative and should be viewed as such, but the dates are invaluable as a long-term planning tool. Appendix D contains the project list, which will continue to be updated bi-annually. Financing of Listed Projects Financing a capital improvement plan is a complex issue. Anticipating the future availability of financial resources to fund projects cannot be accomplished with any degree of certainty. Nonetheless, an analysis of what resources appear to be available for such long-term purposes is needed since most of the projects listed would be considered long-term and would have a significant impact on future resources. This section will provide the “best guess” as to how the long-range capital needs of the City of Camas might be financed. Capital Improvement Plan Goal The City will produce a viable, yet realistic, capital improvement plan which, when administered, will provide the necessary facilities and services to the citizens of the community. 5.13 Franchise Utilities One of the evaluation criteria used in defining the UGA was that urban services would be available concurrent with all development. These services include all utilities that are privately and publicly provided. This section addresses the privately provided facilities. GMA requires all comprehensive plans to include an element describing existing and proposed utilities, including power, gas, and telecommunication facilities. For the City of Camas, power is provided by Clark Public Utilities, gas is provided by Northwest Natural, and telecommunication facilities are provided by companies such as Verizon, Frontier, and others. All utilities are regulated by the Washington Utilities and Transportation Commission (WUTC). Typically, utility providers, with the primary responsibility of serving their customers, have worked with the City. Although each utility must plan the distribution of its services, siting facilities within existing corridors has become increasingly important. Also, given heightened environmental protections and community design standards, more coordination is necessary. Likewise, the City supports programs that encourage energy and resource conservation. 5.13.1 Existing Conditions and Future Needs This section summarizes general information pertaining to the existing utilities in the City. It does not inventory the capacity of the existing system since that information is unavailable. Electrical Clark Public Utilities indicates there is ample capacity to meet existing demand for areas within both the incorporated City limits and the UGA. Natural Gas Delivery of natural gas to Camas and its UGA is provided by Northwest Natural. The delivery of natural gas is governed by the Federal Energy Regulatory Commission, the National Office of Pipeline Safety, and the WUTC. The City’s regulations include safety and emergency provisions, LOS standards, and rate limitations. Northwest Natural provides natural gas service to all of Clark County. The alignment of the main pipeline crosses the Columbia River at the area of the Port of Camas-Washougal. Additionally, Northwest Natural is improving its backbone through the City with the installation of a large-diameter high-pressure gas main connecting Lake Road and Pacific Rim Boulevard. Telecommunications Verizon provides local telephone service to the City and its UGA. Many of the telecommunication facilities, including aerial and underground, are co-located with those of the electrical power provider. 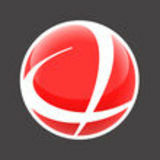 Frontier Communications also provides telecommunications to a large number of customers in the Camas area. 5.13.2 Franchise Utilities Goals and Policies The future specific locations and capacities of utilities are not addressed in this section because the location, capacity, and timing of utility improvements depend greatly on opportunities for expansion, the particular location, and the rate of growth of Clark County and the City. In general, the siting and expansion of service will be coordinated with the development phases of the City, and the City will work with each utility in the permit approval process to assure timely development. efficient land use patterns and transportation systems. 5.14 School Districts 5.14.1 School District Capital Facilities Plans and Impact Fees There are three school districts within City limits. In general, the Camas School District serves the central and southern areas of the City, and extends to serve a portion of the north side of Lacamas Lake. The north and northwest areas of the City are in the Evergreen School District. The southeast portion of the City is generally within the boundary of the Washougal School District. The districts submit their capital facilities plans every other year, accompanied by impact fee calculations. The plans describe the existing and planned school facilities and services. The districtsâ&#x20AC;&#x2122; plans and impact fee calculations are attached as Appendix J. Economic Development The Economic Development Element aims to promote a wide range of employment opportunities for the citizens of the community and to provide a setting and quality of life that attract businesses and residents. Vision In 2035, the economy has grown to attract a variety of businesses that offer stable employment opportunities and family-wage jobs in the medical and high tech fields. Camas is a gateway to nature and recreational opportunities, leading to a robust tourism industry. Professional office, medical, and industrial uses typify western Camas, with retail businesses supporting the large campus firms. The North Shore area will fulfill the employment and retail needs of the growing population on the northeast side, and reduce trips outside the city. Downtown Camas retains its historic atmosphere as a walkable, attractive place to shop, dine, and gather. Housing within the city’s core contributes to a town center that supports local businesses. Economic Development Overview Economic development for the City of Camas is the creation and sustenance of a diverse array of employment opportunities, ensuring the tax base currently enjoyed by the City endures and is strengthened. The economic health and well-being of the City are tied to commitments to promote a wide range of employment opportunities for the citizens of the community and to provide a setting and quality of life that attract businesses and residents. While GMA does not specifically require such an element, the City of Camas believes it is important to include an Economic Development Element in its comprehensive plan. Planning a diverse and vibrant economy must start by understanding current economic conditions in the City and Clark County. While the City’s past economic health was closely tied to the paper mill, in more recent years, the City’s economy has diversified and now supports many technology and manufacturing firms, as well as a growing school system and professional offices. The tables below compare the median household incomes and percentage of civilian workers employed in all industry sectors, as defined by the North American Industry Classification System, within the City and Clark County from 2010 to 2013. Source: U.S. Census Bureau, 2013 American Community Survey (ACS) 3-year estimate (2011–2013) and 2010 ACS 5-year estimate (2006–2010). Notes: 1 Percentages have been rounded to the nearest whole number. 2 The total number of civilian workers in 2013 in Camas was 9,093 and 215,992 in Clark County. In 2010, the total number of civilian workers in Camas was 8,733 and 211,215 in Clark County. 3 Additional information on industry categories can be found on the Bureau of Labor Statistics website: http://www.bls.gov/iag/home.htm. As illustrated in Table 6.2, between 2010 and 2013, Camas saw declines in construction and professional, scientific, and management jobs, a small decline in manufacturing jobs, and an increase in educational services, healthcare, and social assistance jobs. These same trends are generally reflected in the County as a whole; however, Camas did experience a greater decline in construction jobs and a greater increase in educational services, healthcare, and social assistance jobs. As the nation recovers from the recent economic recession, these trends in employment by industry sector are reflected in the economies of the nation and the state. 5 In order to support the continued growth of the Camas economy and the planned increase of 11,182 jobs by the year 2035, 6 the Economic Development Element establishes goals and policies that seek to maintain the diversification of employment opportunities. The City is targeting businesses that provide a greater proportion of family-wage jobs. Increasing retail services in support of residential, industrial, and professional business growth is highly desirable. 2014 Labor Market and Economic Report, Washington State Employment Security Department, published March 2015. As noted in the Land Use Element of Camas 2035, GMA requires that each jurisdiction accommodate its share of the region’s growth. Based on analysis conducted by Clark County and each municipality within the County, Camas’ share of the region’s growth is expected to be 11,182 jobs. attract businesses and residents. 6.4.1 Citywide Economic Development Citywide Economic Development Goal ED-1: Maintain a diverse range of employment opportunities to support all residents and provide a setting and quality of life that attract and retain businesses. tourism and benefit residents and employers. ED-1.5: Ensure adequate infrastructure is planned or in place to nurture and incubate new businesses. 6.4.2 Downtown Downtown Camas is the historic center of the City, which has seen steady redevelopment in recent years with a brew pub, conversion of uses (e.g., Ford dealership to offices), and a new building on NE Everett. Land uses in downtown include a mix of retail services, restaurants, professional offices, government services, and single- and multi-family residential development. Downtown Camas is also home to several community events throughout the year, including Camas Days. These events attract thousands of people to downtown and support the local economy and community. Downtown Economic Development Goal ED-2: Maintain Downtown Camas as the heart of the City and encourage development/redevelopment from 3rd Avenue to 6th Avenue, and Adams to Garfield, which respect the areaâ&#x20AC;&#x2122;s historic character and support walkability and a range of diverse services. additional parking on the edges of the downtown district, which could also serve as a park and ride transit facility. 6.4.3 Grass Valley Grass Valley is home to several national and international technology and manufacturing firms. Land uses in Grass Valley include large technology and manufacturing campuses, surrounded by retail and commercial services and residential development. The City has invested in significant infrastructure improvements in Grass Valley in support of high-tech industrial development, which is still the focus for this area. to achieve sustainable development, with the intention of increasing economic gains and improving environmental quality. Grass Valley Economic Development Policies ED-3.1: Promote the development of a subarea plan that will capitalize on the creation and retention of industries that provide family-wage jobs. ED-3.2: Subarea planning should capitalize on existing facilities and infrastructure and include a mix of uses that are trail- and transit-oriented and designed with high-quality streetscape appeal. ED-3.3: Protect employment land from conversion to residential uses by requiring an analysis of adequate buildable lands in Grass Valley to meet 20-year employment projections prior to land conversion approval. 6.4.4 North Shore The area north of Lacamas Lake is anticipated to experience substantial growth and redevelopment within the 20year planning horizon. Planned transportation infrastructure will improve transportation connectivity throughout the City and support the employment and retail uses desired in the North Shore area. A large portion of the land in this area is zoned Business Park and Multi-Family, with some Commercial and lower density residential zoning. The Port of Camas-Washougal manages an airport that is outside City limits, but most of the developable land in the North Shore area is within the airport influence area. North Shore Economic Development Goal ED 4: To encourage master planning that allows a more intense level of development, well-served by transportation options and includes facilities for pedestrian and bicycle travel, a range of housing choices, and a mix of shops, services, and public spaces. biking distance of a person’s home or work to encourage greater physical activity, including shared-use paths (or trails) that link homes, work and commercial centers, public transit, and community facilities. ED-4.4: Promote economic development opportunities adjacent to the Port of Camas-Washougal’s Grove Field that will benefit from additional transportation options. ED-4.5: Preserve large tracts of land for large industry and master-planned commercial development. ED-4.6: Support public-private partnerships for infrastructure development. ED-4.7: Advocate better transit routes and service. 6.4.5 Eastside Commercial District The Eastside Commercial District has tremendous economic growth potential and would benefit from targeted streetscape improvements. The development of a streetscape that is attractive and safe for all modes of transportation (e.g., bicycles, wheelchairs, pedestrians) could attract new economic opportunities and investment to the area. This commercial area generally straddles NE Third Avenue at the City’s eastern edge to the bridge over the Washougal River. The commercial structures are single-story, with stretches along the street that are in disrepair and vacant. Scattered businesses have been recently renovated. This vehicle-dominated corridor has several drivethrough chain restaurants and large parking lots adjoin the street. There are no pedestrian or bicycle amenities and landscaping is scarce or non-existent. Refer to “Airport and Compatible Land-Use Program Guidebook,” Washington State Department of Transportation; available online at http://www.wsdot.wa.gov/aviation/Planning/ACLUguide.htm. Eastside Commercial District Economic Development Goal ED 5: To create a redeveloped and revitalized Eastside Commercial District that supports existing and new uniqueto-Camas businesses and recreation within a safe and pedestrian-friendly streetscape. Eastside Commercial District Economic Development Policies ED-5.1: Develop commercial and mixed-use areas that are safe, comfortable, and attractive to pedestrians. ED-5.2: Reinforce streets as public places that encourage pedestrian and bicycle travel and provide transitions between Third Avenue and neighborhoods. ED-5.3: Encourage efficient land use by facilitating compact, high-density development and minimizing the amount of land that is needed for surface parking. ED-5.4: Improve wayfinding to recreational amenities. 6.4.6 Gateways and Corridors Community gateways create a sense of arrival and let visitors and residents know they are in Camas. Primary and secondary gateways are designated to distinguish between gateways that offer a primary entrance into Camas and those that are secondary and serve as an entrance to a particular part of the City. A corridor extends approximately 0.25 mile from the gateway and includes enhanced features such as bike lanes, widened or detached sidewalks, and signage. As outlined in the Land Use Element, gateways are established as an overlay zone and identified on the Camas Zoning Map. through the development of community gateways. to the sidewalk. Encourage landscaping, rather than parking, between the building and the street in order to create a welcoming streetscape.